Good evening, space fans! Welcome back to another installment of all the best news from low-Earth orbit. Yesterday, a SpaceX Falcon 9 rocket successfully launched a Dragon capsule bound for the ISS, bearing over 5,100 payload pounds of scientific supplies, food, and equipment. According to Reuters, in a novel approach to recovering the 14-story Falcon 9 rocket boosters, SpaceX CEO Elon Musk had planned for the discarded boosters to be remotely flown to an offshore landing site. Like a giant, extremely expensive game of lawn darts...with rockets. Remarkably, the first rocket did indeed hit its target, on an ocean landing pad some 500 miles off the Florida coast. Unfortunately, it fell apart soon after. Musk tweeted that the rocket's “Grid fins worked extremely well from hypersonic velocity to subsonic, but ran out of hydraulic fluid right before landing.” The hydraulic fluid, which operated the four maneuverable grid fins to remotely position the rockets and stabilize their descent, will be augmented in the next mission so that another attempt at safely landing the rockets may be made. SpaceX, which is under a $1.6 billion contract to NASA for ferrying supplies to the ISS, is the current closest replacement the United States has for its sidelined Space Shuttle program. After the fiery disaster that left an Orbital Sciences Corp. rocket decimated last October, SpaceX is now the go-to American rocketry provider to the ISS. This mission was the fifth of a slated twelve. The Dragon, breathing fire during liftoff. One of the most interesting bits of cargo aboard the SpaceX Dragon is a colony of fruit flies, which are endlessly annoying on Earth but may contribute to significant scientific research aboard the ISS. Fruit flies' immune system responses are a close approximation of those found in humans, and research on how they react to microgravity could lend useful results for humans undergoing the same events. This is particularly notable due to the fact that the fruit flies will be exposed to various microbes that (due to lack of gravity and subsequent cellular structural changes) become more virulent in a space environment. Yes, those pesky little bugs might end up figuring out how to someday save a sick spacefarer. And they don't even have to go through all the crazy intense training! 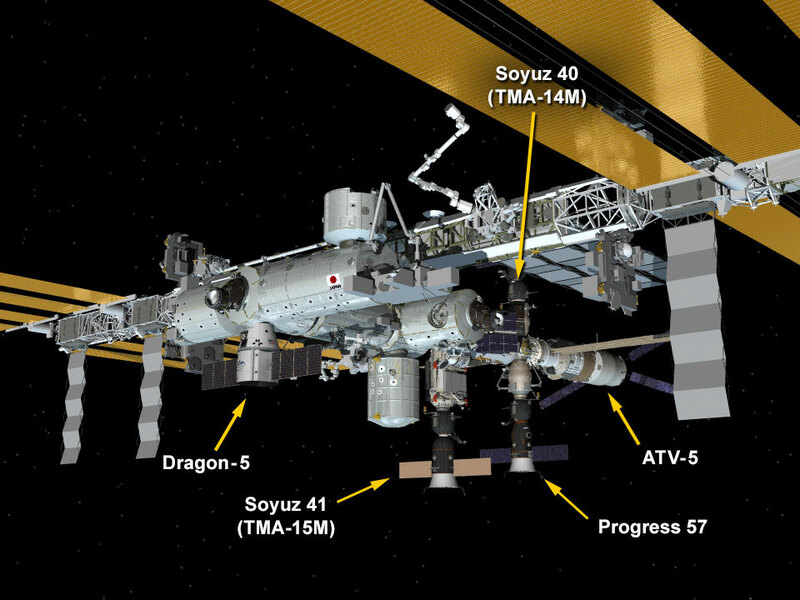 When the Dragon does dock at the ISS, it will be among five other spacecraft moored there. But the design of the ISS conveniently allows room for all of them. Plenty of parking space in space. Another scientific experiment of interest this week on the ISS was the Haptics-1 experiment, which NASA defines as, "studying the feasibility of controlling robots on the ground from space with a crew member using an advanced joystick that provides haptic feedback." Basically, the astronauts use a joystick with a rumble-pack that allows them to better sense the issues a robot rover on a planet below might be encountering. This allows for refinement of motorized tasks and better overall control of the situation on the ground. From an extremely speculative perspective, our astronauts could someday use this technology to land robot rovers on a foreign planet and, instead of getting put into harm's way themselves, simply feel a buzz in their hand controls if aliens were to shoot up the robots. This is particularly interesting to study on the ISS, for the reactions from the haptic controller would have immediate effect on the astronaut's physical position while in microgravity. An astronaut might have to buckle himself or herself to a seat just to deal with even the smallest amount of force exerted on them from the controller. And in some artistic news to compliment the science, NASA astronaut Terry Virts and Commander Butch Wilmore spent time using an IMAX camera to document interior scenes from the ISS. This footage will be part of an upcoming 3D movie called "A Perfect Planet." According to NASA, the film will be for audiences of all ages and will illustrate "the importance of conservation, sustainability and environmental awareness for future generations." Saudi Arabia, from a particularly peaceful perspective. That's all from orbit for this week, space fans! Thanks for reading and be sure to check in next week for even more awesomeness above the atmosphere...watch this space! A perfect planet...it's just the humans we have to worry about.